Girona 500 and Sparus II are autonomous hovering vehicles that can be adapted by the end-user to a wide range of applications. This feature, together with their low weight, low requirements for its operation at sea and the added value of using ROS, convert them in a very interesting base platform for research centres that want to develop their own technology. One of the current users of our vehicles is GEOMAR – Helmholtz Centre for Ocean Research Kiel, a world-wide leading institute of marine research based in Kiel (Germany). 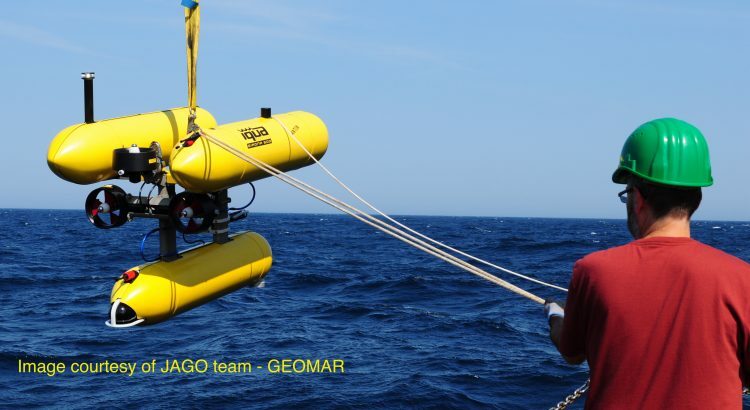 GEOMAR incorporated Girona 500 to its high-performance infrastructure in underwater robotics, to be used in different research fields related to marine sciences. According to the research institute, “ANTON (Geomar’s Girona 500) is extremely useful for surveys in many marine areas because it is small and handy and can be deployed from small vessels”. ANTON had its first assignment on the POSEIDON expedition POS526, which ran from late July to mid-August to working areas in the central North Sea and off the coast of Norway. The expedition included the manned research diving boat JAGO, among others, to observe ANTON during his firsts dive trials. ANTON did ten dives where extensive seabed datasets were collected, including CTD measures. Also, images of the seabed were acquired and they will be used for scientific studies and further technology development. From beginning of 2019, Geomar’s fleet has a new member, LUISE, a second Girona 500 that will work with ANTON in the framework of the MOSES infrastructure, leaded by the institute. Girona 500 and Sparus II were originally developed in the framework of different research projects at the University of Girona with the main goal of being flexible in terms of configuration, software and equipment integration. Since they became commercial AUVs, the vehicles have increased their capabilities and robustness, becoming an alternative to other vehicles in the market.